(CNS): Passengers travelling from Owen Roberts International Airport on Grand Cayman this morning were evacuated as a result of a false alarm. Travellers told CNS that they entire facility was emptied at around 6:45am and people were outside for around 20 minutes before the fire service arrived and cleared the building. Airport officials confirmed, however, that there was no fire or any other emergency but a glitch in a very new alarm system at the airport. 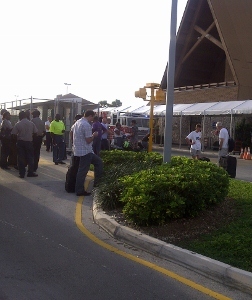 A spokesperson for Cayman Airports said that the authority would release more details about the incident later. I was there and spoke to one of the firemen about the length of time it took for them to arrive – apparently they were not called right away, therefore, no call, no response. They came when called, did their job, cleared the site for continuation of use andleft. The frustrating part was that the airport did not explain anything to any of the passengers. We were a little put out with the whole situation – learning that it had also happened the night before. I agree that glitches happen and it is always best to be safe than sorry – but if you know that your system is new and bugged, at least explain that and turn it off. Hopefully the Aiprorts Authority, in their report, will detail the fire crew response time. On the face of it 20 minutes sounds long, so it would help to have the timeline of when the alarm was reported to them, what was reported, and when (and where) they first responded to. My suspicion is that the fire crew was either around the back first or there was something else why they took a reported 20 minutes to get there, but I'd like to know. Hold up…it took 20 MINUTES for the fire service to show up????????? They are right NEXT DOOR….WTF were they doing in that time???? What if this had been for real…?? I hope it did not take the Fire Service 20 minutes to arrive as suggested in the article! At least we know it is working, but Glitches can cause people to push the wrong button too. FIX IT. Safety is first, and I would not fly anything else but Cayman Airways. Thank you Cayman Airways for always putting safety first. Get and keep those planes always serviced Good. OK.
Kinda limiting yourself a bit there buddy. I don't think Cayman Airways fly everywhere. Actually, Cayman Airways also flies to Chicago, New York, Washington, Dallas, Panama, La Ceiba, Havana, Kingston and Montego Bay. I think the poster's point was that if flying to any of these destinations they will not fly any other airline. I agree.